a pulmonary malignancy attributable in the majority of cases to cigarette smoking. Other predisposing factors are exposure to acronitrile, arsenic, asbestos, beryllium, chloromethyl ether, chromium, coal products, ionizing radiation, iron oxide, mustard gas, nickel, petroleum, uranium, and vinyl chloride. Lung cancer develops most often in scarred or chronically diseased lungs. It is usually far advanced when detected because metastases may precede detection of the primary lesion in the lung. Symptoms of lung cancer include persistent cough, hoarseness, dyspnea, purulent or blood-streaked sputum, chest pain, and repeated attacks of bronchitis or pneumonia. Diagnostic measures include x-ray films, fluoroscopy, tomography, bronchography, angiography, cytological studies of sputum, bronchial washings or brushings, and needle biopsy. Epidermoid cancers and adenocarcinomas each account for approximately 30% of lung tumors; about 25% are small, or oat, cell carcinomas; and 15% are large cell anaplastic cancers. Small cell carcinomas frequently metastasize widely before diagnosis. Surgery is the most effective treatment, but only about 20% are resectable. Lung cancer is essentially incurable unless surgical resection can be accomplished. Thoracotomy is contraindicated if metastases are found in contralateral or scalene lymph nodes. Irradiation is used to treat localized lesions and unresectable intrathoracic tumors and as palliative therapy for metastatic lesions. Radiotherapy may also be administered after surgery to destroy remaining tumor cells and may be combined with chemotherapy. Targeted therapy with drugs such as paclitaxel, carboplatin, irinotecan, and erlotinib has also shown results. Chemotherapy is especially indicated for small cell carcinoma. 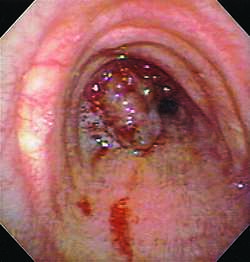 LUNG CANCER: Lung cancer seen endoscopically. The tumor is bleeding after being biopsied. Treatment includes lung surgery, radiation therapy, and chemotherapy usually in combination. Staging determines the extent of the disease and aids in planning treatment and predicting the prognosis. Lung cancer is relatively difficult to cure but much easier to prevent. Children and adolescents should be discouraged from smoking tobacco products, and current smokers should be assisted in their efforts to quit, e.g., through referrals to local branches of the ACS, smoking-cessation programs, individual counseling, or group therapy. Chest x-rays do not show small, early cancers, but CT scanning can be used to screen people who have a long history of smoking and who are 50 to 60 years old. In this high-risk group, screening detects the disease in its early stages when it is most likely to be curable. However, since screening is very expensive, and since there are millions of smokers, the public health costs of mass screening are high compared with the cost of encouraging smokers to quit or of teaching teenagers not to start smoking. An inaccurate term usually referring to cancer of the lining of one of the air tubes (bronchi). The medical term is bronchial carcinoma. This tumour accounts for more than half of all male deaths from cancer and the incidence in women is rising rapidly. In most cases it is caused by cigarette smoking. The first sign of lung cancer may be a change in the character of the cough with a little blood in the sputum. Collapse of a lung lobe may cause breathlessness. Pain in the chest is common, especially if the cancer has spread to the lung lining (pleura) or the chest wall. Often there are no symptoms until the cancer has spread to other parts of the body, such as the brain, the liver or the bones. Diagnosis is by X-ray examination or CT scanning or by BRONCHOSCOPY. If the tumour is localized to one lobe or one lung, surgical removal of the lobe or lung offers the best chance of survival. Even in these cases, the 5 year survival rate is only about 30%. If there has been further spread, the outlook is poor. Chemotherapy and radiotherapy may sometimes prolong life a little, but cannot cure the condition. It has been shown (2006) that screening by spiral CT scanning can detect clinical stage I cancer that is curable. Lung cancer is the leading cause of cancer death for men and women in the United States. The Centers for Disease Control and Prevention also reported that it is the second most common cancer diagnosis after breast cancer for women and prostate cancer for men. Annually, more than 220,000 people are diagnosed with lung cancer and 160,000 die from the disease. Lung cancer accounts for 28% of all cancer deaths and accounts for more deaths than prostate, breast, and colon cancer combined. The 1-year survival rate remains approximately 41%, and the 5-year survival rate is 15%. Only 16% of lung cancers are found at an early, localized stage, when the 5-year survival rate is 49%. The survival rate for lung cancer has not improved over the past 10 years. There are two major types of lung cancer: small cell lung cancer (SCLC) and non–small cell lung cancer (NSCLC). Sometimes a lung cancer shows characteristics of both types and is labeled small cell/large cell carcinoma. Both types have the capacity to synthesize bioactive products and produce paraneoplastic syndromes such as syndrome of inappropriate antidiuretic hormone (SIADH), Cushing’s syndrome, and Eaton-Lambert syndrome of neuromuscular disorder. SCLC accounts for 13% of all lung cancers and is almost always caused by smoking. SCLC is characterized by small, round to oval cells generally beginning in the neuroendocrine cells of the bronchoepithelium of the lungs. They start multiplying quickly into large tumors and can spread to the lymph nodes and other organs. At the time of diagnosis, approximately 70% have already metastasized, often to the brain. SCLC is sometimes called small cell undifferentiated carcinoma and oat cell carcinoma. NSCLC accounts for approximately 87% of all lung cancers and includes three subtypes: squamous cell carcinoma, adenocarcinoma, and large cell undifferentiated carcinoma. Squamous cell carcinoma, also associated with smoking, tends to be located centrally, near a bronchus, and accounts for approximately 25% to 30% of all lung cancers. Adenocarcinoma, accounting for 40% of all large cell carcinoma, is usually found in the outer region of the lung. One type of adenocarcinoma, bronchioloalveolar carcinoma, tends to produce a better prognosis than other types of lung cancer and is sometimes associated with areas of scarring. Large cell undifferentiated carcinoma starts in any part of the lung, grows quickly, and results in a poor prognosis owing to early metastasis; approximately 10% to 15% of lung cancers are large cell undifferentiated carcinoma. 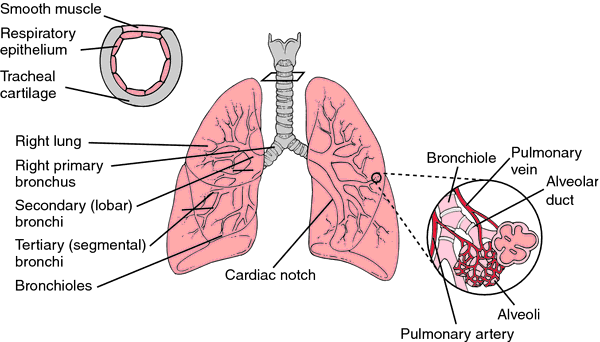 The hilus of the lung, close to the larger divisions of the bronchi, is the most frequent site of lung cancer. Abnormal cells divide and accumulate over time. As the cells grow into a carcinoma, they make the bronchial lining irregular and uneven. The tumor may penetrate the lung wall and surrounding tissue or grow into the opening (lumen) of the bronchus. In more than 50% of patients, the tumor spreads into the lymph nodes and then into other organs. Systemic effects of the lung tumor that are unrelated to metastasis may affect the endocrine, hematologic, neuromuscular, and dermatologic systems. These changes may cause connective tissue and vascular abnormalities, referred to as paraneoplastic syndromes. In lung cancer, the most common endocrine syndromes are SIADH, Cushing’s syndrome, and gynecomastia. Complications of lung cancer include emphysema, bronchial obstruction, atelectasis, pulmonary abscesses, pleuritis, bronchitis, and compression on the vena cava. Approximately 80% of lung cancers are related to cigarette smoking. Lung cancer is 10 times more common in smokers than in nonsmokers. In particular, squamous cell and small cell carcinoma are associated with smoking. Other risk factors include exposure to carcinogenic industrial and air pollutants, such as asbestos, coal dust, radon, and arsenic, and family history. Both somatic and germline mutations in several genes, including SLC22A1L, TP53, KRAS2, BRAF, ERBB2, MET, STK11, PIK3CA, and EGFR, have been implicated in pathogenesis of lung cancer. Recently, a locus for a lung cancer susceptibility gene has been linked to a site on chromosome 6. The average age of people diagnosed with lung cancer is 70, and it is an unusual diagnosis for people under 45. Of the total number of deaths from lung cancer each year, 57% are men and 43% are women. The chance of men developing lung cancer is 1 in 13 and women 1 in 18. There has been an observable decline in deaths among younger men, and this is probably related to the diminishing number of young men who smoke. Deaths among women have been rising, although the rate of increase has slowed in recent years. Squamous cell carcinoma is most common in male smokers. Adenocarcinoma is equally common in men and women. Incidence rates appear to be higher in African American men than in white or Asian American men. The global incidence of lung cancer is approximately 13 per 100,000 females per year and 31 per 100,000 males per year. The incidence is four to five times higher in developed than in developing countries, with the highest incidence in the British Isles and Poland. As smoking rates increase in developing countries such as India and China, experts expect rates of lung cancer to increase. Establish a history of persistent cough, chest pain, dyspnea, weight loss, or hemoptysis. Ask if the patient has experienced a change in normal respiratory patterns or hoarseness. Some patients initially report pneumonia, bronchitis, epigastric pain, symptoms of brain metastasis, arm or shoulder pain, or swelling of the upper body. Ask if the sputum has changed color, especially to a bloody, rusty, or purulent hue. Elicit a history of exposure to risk factors by determining if the patient has been exposed to industrial or air pollutants. Check the patient’s family history for incidence of lung cancer. Many people are asymptomatic. As the disease progresses, symptoms are cough, dyspnea, wheezing, and hemoptysis. The clinical manifestations of lung cancer depend on the type and location of the tumor. Because the early stages of this disease usually produce no symptoms, it is most often diagnosed when the disease is at an advanced stage. In 10% to 20% of patients, lung cancer is diagnosed without any symptoms, usually from an abnormal finding on a routine chest x-ray. The clinical findings of lung cancer may be localized to the lung or may result from the regional or distant spread of the disease. Auscultation may reveal a wheeze if partial bronchial obstruction has occurred. Auscultate for decreased breath sounds, rales, or rhonchi. Note rapid, shallow breathing and signs of an airway obstruction, such as extreme shortness of breath, the use of accessory muscles, abnormal retractions, and stridor. Tumor involvement of the pleura and chest wall may cause pleural effusion. Typically, pleural effusion causes dullness on percussion and breath sounds that are decreased below the effusion and increased above it. Monitor the patient for oxygenation problems, such as increased heart rate, decreased blood pressure, or an increased duskiness of the oral mucous membranes. Metastases to the mediastinal lymph nodes may involve the laryngeal nerve and may lead to hoarseness and vocal cord paralysis. The superior vena cava may become occluded with enlarged lymph nodes and cause superior vena cava syndrome; note edema of the face, neck, upper extremities, and thorax. The patient undergoes major lifestyle changes as a result of the physical side effects of cancer and its treatment. Interpersonal, social, and work role relationships change. The patient is faced with a psychological adjustment to the diagnosis of a chronic illness that frequently results in death. Evaluate the patient for evidence of altered moods such as depression or anxiety, and assess the patient’s coping mechanisms and support system. The treatment of lung cancer depends on the type of cancer and the stage of the disease. Surgery, radiation therapy, and chemotherapy are all used. Unless the tumor is small without metastasis or nodes when discovered, it is often not curable. Surgical treatment ranges from segmentectomy or wedge resection (removal of a part of a lobe) to lobectomy (removal of a section of the lung) to pneumonectomy (removal of an entire lung). These procedures all require general anesthesia and a thoracotomy (surgical incision in the chest). If patients are unable to undergo a thoracotomy because of other serious medical problems or widespread cancer, laser surgery may be performed to relieve blocked airways and diminish the threat of pneumonia or shortness of breath. Chemotherapy is used for cancer that has metastasized beyond the lungs. It is used both as a primary treatment and an adjuvant treatment to surgery. The chemotherapy most often uses a combination of anticancer drugs; different combinations are used to treat NSCLC and SCLC. Radiation therapy is sometimes the primary treatment for lung cancer, particularly in patients who are unable to undergo surgery. It is also used palliatively to alleviate symptoms of lung cancer. In conjunction with surgery, radiation is sometimes used to kill deposits of cancer that are too small to be seen and thus to be surgically removed. Radiation therapy takes two forms: External beam therapy delivers radiation from outside the body and focuses on the cancer and is most frequently used to treat a primary lung cancer or its metastases to other organs; brachytherapy uses a small pellet of radioactive material that is placed directly into the cancer or into the nearby airway. Maintain a patent airway. Position the head of the bed at 30 to 45 degrees. Increase the patient’s fluid intake, if possible, to assist in liquefying lung secretions. Provide humidified air. Suction the patient’s airway if necessary. Assist the patient in controlling pain and managing dyspnea. Assist the patient with positioning and pursed-lip breathing. Allow extra time to accomplish the activities of daily living. Teach the patient to use guided imagery, diversional activities, and relaxation techniques. Provide periods of rest between activities. Discuss the expected preoperative and postoperative procedures with patients who are undergoing surgical intervention. Emphasize the importance of coughing and deep breathing after surgery. Splinting the patient’s incision may decrease the amount of discomfort the patient feels during these activities. Monitor closely the patency of the chest tubes and the amount of chest tube drainage. Notify the physician if the chest tube drainage is greater than 200 mL/hour for more than 2 to 3 hours, which may indicate a postoperative hemorrhage. Early in the postoperative period, begin increasing the patient’s activity. Help the patient sit up in the bedside chair and assist the patient to ambulate as soon as possible. Explain the possible side effects of radiation or chemotherapy. Secretions may become thick and difficult to expectorate when the patient is having radiation therapy. Encourage the patient to drink fluids to stay hydrated. Percussion, postural drainage, and vibration can be used to aid in clearing secretions. The patient may experience less anxiety if allowed as much control as possible over his or her daily schedule. Explaining procedures and keeping the patient informed about the treatment plan and condition may also decrease anxiety. If the patient enters the final phases of lung cancer, provide emotional support. Refer the patient and family to the hospice staff or the hospital chaplain. Encourage them to verbalize their feelings surrounding impending death. Allow for the time needed to adjust while helping the patient and family begin the grieving process. Assist in the identification of tasks to be completed before death, such as making a will; seeing specific relatives and friends; or attending an approaching wedding, birthday, or anniversary celebration. Urge the patient to verbalize specific funeral requests to family members. Temel, J.S., Greer, J.A., Muzikansky, A., Gallagher, E.R., Admane, S., Jackson, V.A., …Lynch, T.J. (2010). Early palliative care for patients with metastatic non-small-cell lung cancer. New England Journal of Medicine, 363(8), 733–742. Investigators conducted a randomized controlled trial over a period of 12 weeks to determine the effects of early palliative care on the quality of life among 77 patients with lung cancer compared to standard care provided to 74 lung cancer patients. Compared to patients in the standard care group, patients in the palliative care group reported less depressive symptoms (16% versus 38%; p 0=.01) and higher quality of life (scores of 98 versus 91.5; p = 0.03). Median survival time was also increased among the palliative care group compared to the standard care group (11.6 months versus 8.9 months; p = 0.02). Teach the patient to recognize the signs and symptoms of infection at the incision site, including redness, warmth, swelling, and drainage. Explain the need to contact the physician immediately. Be sure the patient understands any medication prescribed, including dosage, route, action, and side effects. Provide the patient with the names, addresses, and phone numbers of support groups, such as the American Cancer Society, the National Cancer Institute, the local hospice, the Lung Cancer Alliance, and the Visiting Nurses Association. Teach the patient how to maximize her or his respiratory effort. Q. LUNG CANCER how do you get it? A. Lung cancer is one of the most common cancers in the world. It is a leading cause of cancer death in men and women in the United States. Cigarette smoking causes most lung cancers. The more cigarettes you smoke per day and the earlier you started smoking, the greater your risk of lung cancer. High levels of pollution, radiation and asbestos exposure may also increase risk. Lately researchers connect this lung cancer with genetic factors. Q. How much do I have to smoke to get lung cancer? If I only smoke 1 cigarette a day will I get cancer? A. some people dont even have to smoke to get lung cancer,just being around someone who smokes can give you lung cancer. Q. My grandfather died of lung cancer because of smoking. what is the probability that I'll get lung cancer as well? My Grandfather was a regular smoker, he died two year ago because of lung cancer. I also smoke and I want to know that if i have a hinge probability to have cancer like that. I would quit smoking if you want to see your children grow up.